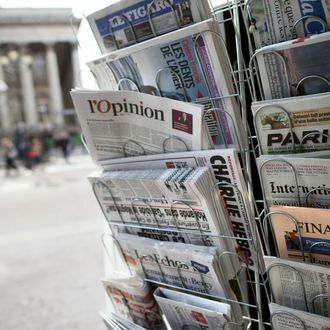 Though Charlie Hebdo dramatically increased its circulation this week, the French satirical weekly was in high demand across France on Wednesday, with some vendors reporting it sold out even before daybreak. New Yorkers intent on getting a copy will have an even more difficult time. Time reports that the magazine has been unavailable in the U.S. since 2010 due to “low demand,” and big-box book and magazine sellers like Barnes and Noble aren’t carrying it. Bouwerie Iconic Magazines on the Bowery requested 200 to 300 copies, but a call placed to them this morning revealed those issues have yet to arrive. We called several of the city’s other biggest international newsstands, including Mulberry Iconic Magazines and B.J. Magazines, and none of them had the title. In fact, foreign magazine distributor LMPI said they had ordered only 300 copies to be distributed between New York, San Francisco, and a few other French magazine retailers in the U.S. Even the New York Public Library is having trouble getting its hands on a copy; the International Business Times reports that the library’s periodicals section has a “standing order” for a copy of the issue, which has yet to be filled. Around the World, perhaps New York’s biggest international magazine retailer, said that they were hoping to have copies of Charlie Hebdo “in a week or two,” so don’t expect to pop over there today and grab one. Soho News International says they should have copies by Saturday. Albertine Books, a French-American bookstore on the Upper East Side, was not taking reservations for copies as they weren’t sure how many they might receive. The store doesn’t open until 11 a.m., and a phone call to them yielded a busy signal, no doubt because of others in search of the same clogging the line. If you want the magazine now, several copies are up for sale on eBay, though some are listed for as much as $400. On Craigslist, the edition is going for $1,000. As it turns out, your best bet for scoring a copy of Charlie Hebdo is probably to have that guy you met while studying abroad in Paris mail one to you. Bonne chance!